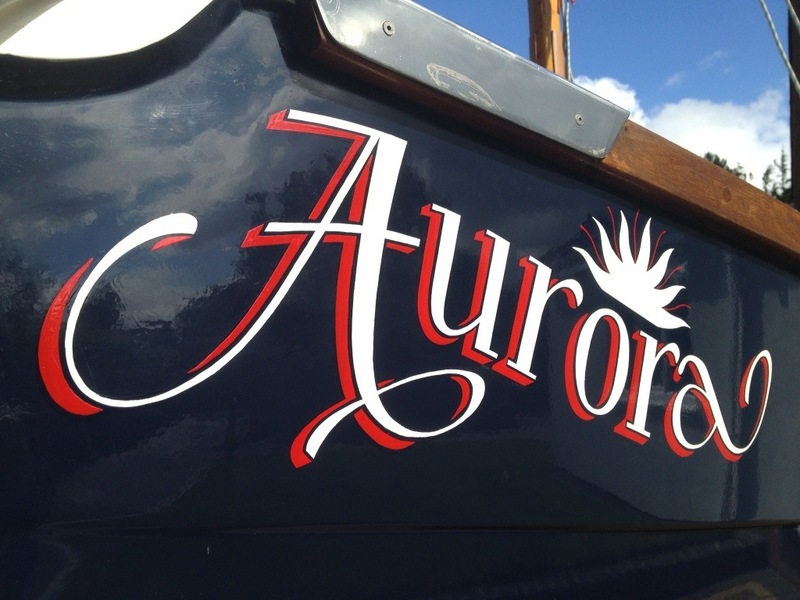 Well, it seems to have taken far longer than I hoped, but another set of mods are (more or less) complete on Aurora. I have modified the mast head and fitted an antenna for the fixed VHF as well as a combination white/tricolour mast head light. These are wired back to the new fascia panel and I have wired a two way switch to some coloured LEDs to show which light is being displayed. The fitting took a long time because I modified the wooden past head with a chisel so that the light fitted into it, rather than ext to it, so it looks neat and tidy. I also took the opportunity to paint the white mast top. At the other end of the mast, after a great deal of umming and erring, I decided to chop about 10mm off the bottom of the mast to ensure that the wires did not pinch. I tried making a groove first, but was not convinced that he wires would stay in the groove (and besides, my carpentry is not a pretty sight! ), so ended up amputating the very bottom of the mast. I left the tails of the cables quite long so that if I forget to unplug, it won’t break the cables or sockets. I reluctantly took the cables through the coach roof on the starboard side and “hid” them with trunking on the cabin roof, before routing them through the cupboards. This was so that the cables were up high and I did not have to make holes in the locker in front of the mast because I have had water on the cabin floor and I did not want it being able to escape. Overall, I’m pretty pleased by how it all looks. 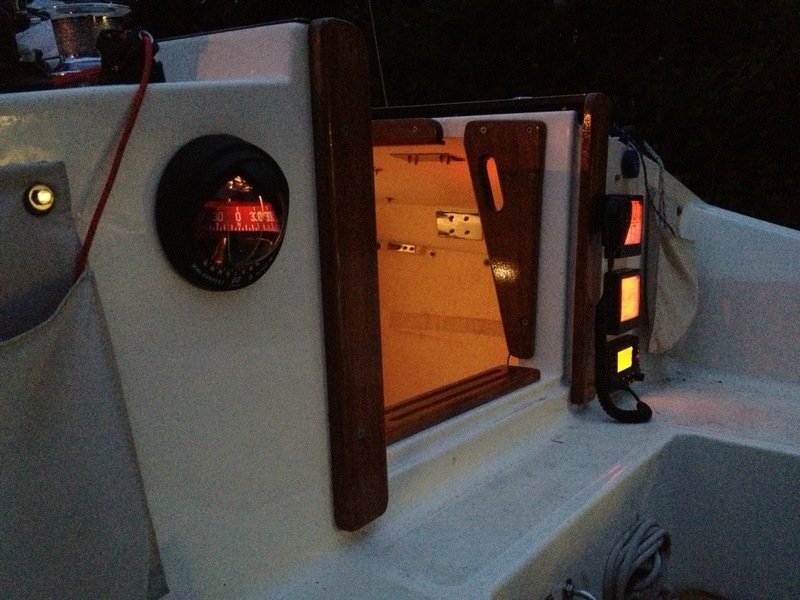 The compass lights up when the mast head light is turned on. The VHF seems to work (I was worried my connections would not be up to snuff). The fascia covers better wiring and now provides some storage. 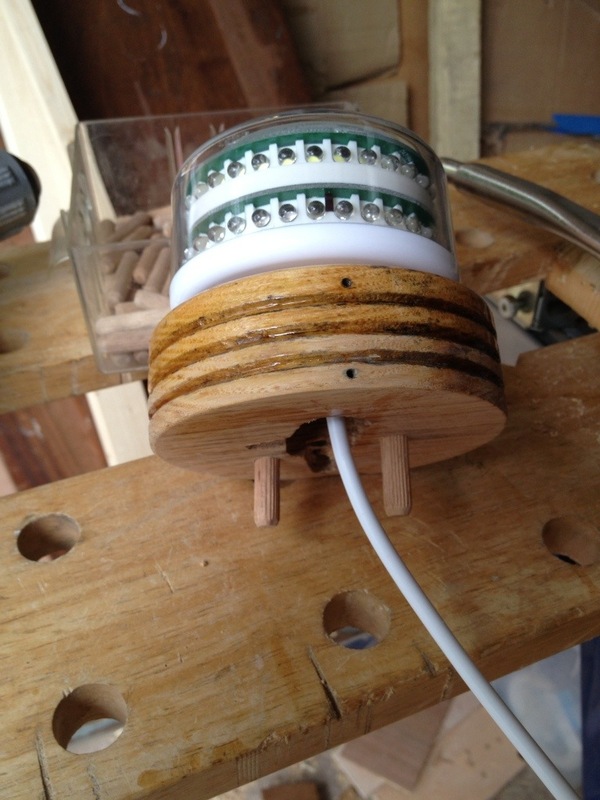 The mast head with light attached with Sikaflex, awaiting varnish. Note the dowels to locate the wooden head onto the mast. Originally screwed on through the top, now sikaflexed into position. 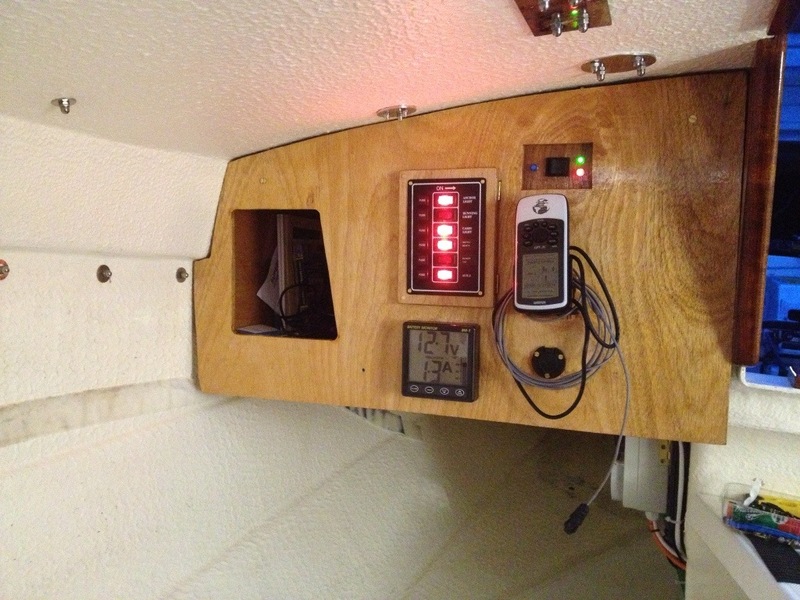 The new fascia panel with battery monitor, GPS bracket (coiled cable is for Yeoman plotter), hinged fuse panel, 12v socket, mast head light switch and storage cubby hole. To be added: storage hooks. Panel from 12mm outdoor ply (too thick- should have used 8mm) and varnished with Ronseal. the instruments lit up. Compass, GPS repeater, depth/log display and VHF.